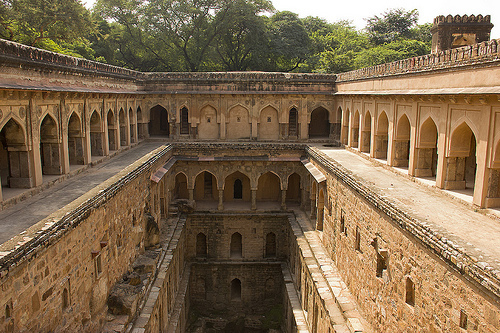 ‘Baoli’ is an Indian word for a Stepwell. Stepwells are essentially ponds or wells in which the water is accessed by climbing down a series of steps. 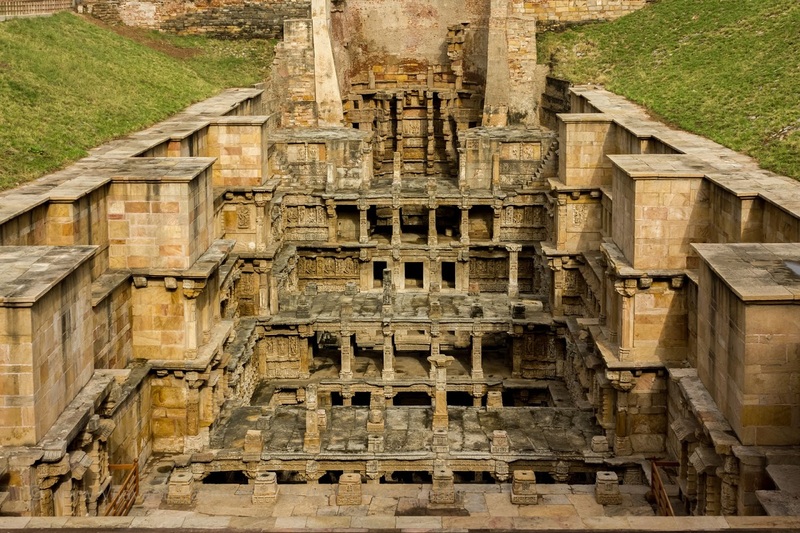 These stepwells were created and developed in India as storage or irrigation tanks, to tackle the seasonal availability of water in certain regions. They are mostly found in western India and in other more arid/dry regions of the country. Some are also multi-storied, with a bullock turning a water wheel to raise the level of well water to the first or second floor. Stepwells or baolis were more popular in the olden days as compared to a normal well or tank, as it facilitated easier access to the groundwater and was easier to maintain and clean the well. They also became a meeting place for women during social gatherings and religious ceremonies, as it was mostly them who collected the water. The baolis were also used for leisure purpose as the deep bottom of the well provided relief and shade from the excessive daytime heat in certain places. So eventually, these stepwells were built with certain embellishments and architectural features, which resulted in them being treated as prestigious monuments long after they ceased to be in use. Having survived the ravages of wars and natural calamities like earthquakes, more than 2000 of these sturdy, well-built stepwells from the bygone era can be found across India in Gujarat, Rajasthan, Delhi, Madhya Pradesh, Karnataka and Maharashtra. Here we have listed just a few of the very famous baolis in the country that one must visit. 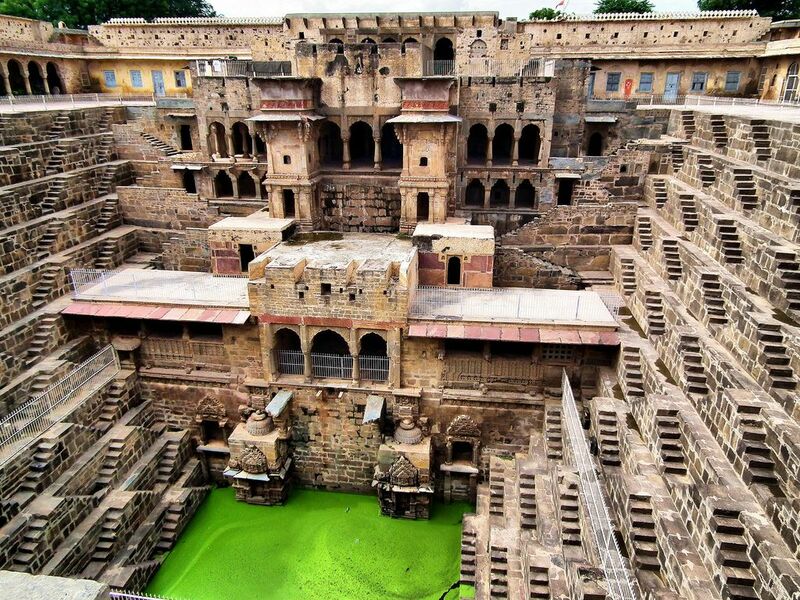 This is one of India’s most magnificent baoli or stepwell, situated in the village of Abhaneri in Rajasthan. The oldest parts of this baoli were built during the 8th century by King Raja Chanda of the Nikumb dynasty of Rajputs, while the upper stories were constructed during the 18th century under the Mughal rule. This mammoth structure is about 13 stories high and extends approximately 100 ft into the ground with 3500 steps, making it one of the largest and deepest stepwells in India. With Rajasthan being an extremely dry region, this baoli was built with the idea to conserve as much water as possible. One side of the well had a pavilion and a resting room for the royals as the air at the bottom of the well was at least 5-6 degrees cooler than the normal temperature outside. Rani ki Vav is an intricately constructed stepwell, built as a memorial to King Bhima in the 11th century by his wife, Queen Udayamati. This baoli is situated on the banks of the Saraswati river, in the town of Patan in Gujarat. Built in the complicated Maru-Gurjara architectural style with an inverted temple, this baoli has earned a place in the list of UNESCO World Heritage Sites in the year 2014. The stepwell has 7 levels of stairs and is adorned with more than 500 principal sculptures. Its brilliant design of multistoried pavilions, compartmentalized stepped corridors and exquisite carvings and sculptures have also earned it the title of ‘Queen’ of stepwells in India. The main theme of these artworks is the ‘Dasavataras’, meaning the ten incarnations of Vishnu, including Buddha. Agrasen ki baoli is located on Hailey Road, Connaught Place in New Delhi. The visible parts of this ancient stepwell extends to three levels and has 108 steps. Each level has a series of arched niches on both sides While there are no historical records stating who built Agrasen ki Baoli, it is widely believed that the structure was initially constructed by the legendary King Agrasen and rebuilt in the 14th century by the Agrawal community, probably during the Tughlaq period, as deduced from the architectural features. This 60 metre long and 15 metre wide baoli is designated a protected monument by the Archaeological Survey of India. 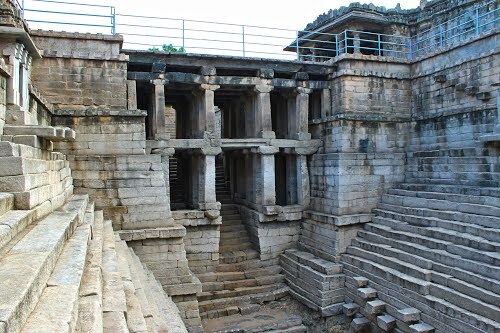 While there are several baolis or stepwells in Lakkundi, the Muskin Bhanvi stepwell is one of the most popular for its architectural finesse and carvings. Lakkundi is a village on the way to Hampi and known for its Chalukya style temples, historic inscriptions and stepwells, many of which are in ruins. Muskin Bhanvi is a beautiful baoli from the 12th century, which is connected to the Manikesvara Temple. This structure can be seen extending outwards from underneath the temple and several shrines, dedicated to Shiva, can be seen in the form of niches in the walls. This is a famous, though almost inconspicuous stepwell, deep in Mehrauli Archaeological Park in New Delhi. It was named thus as it was used by the Kings Masons or Raj mistries. The stepwell has four diminishing levels and three sides of the structure is designed with rows of pillars forming walkways or arcades. The inscription on the structure indicates that this impressive baoli was built by Daulat Khan Lodi during the reign of Sikander Lodi in 1512. He also built a mosque just next to the stepwell and was buried in its square after his death. 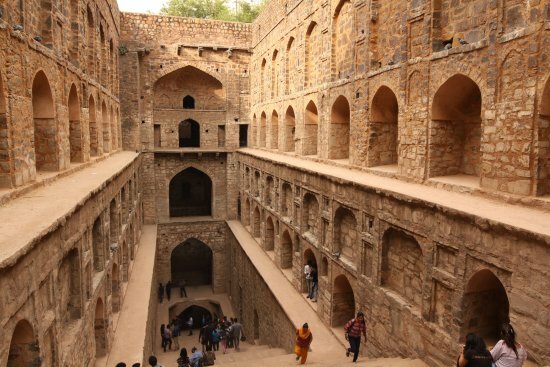 Located nearby is another stepwell, popularly known as Gandhak ki Baoli.